I do carry on painting almost daily but recently it felt more like a chore, more guilt driven than actually enjoying the activity. When I started painting and drawing, I jumped in full of excitement and could not wait to get back into it. For the last few months this has changed. Reasons are pressures I put on myself, ambitions and thinking about sales rather than having fun. So I'm having a break. My fingers are already itching, the break won't last long, but what comes after will be a new step forward, a new direction or a new approach to my subjects. 1. Stop worrying about sales. One reason was that I thought I can justify the cost of the materials if I sell enough. But in the beginning that was never the point. And gosh, we're all guilty of the unwrapping of new toys - to me more exciting than clothes, shoes etc - artist materials, new colours, new paper - highly addictive. 2. Stop worrying about perceptions. Not everything needs to be shared I guess, and without disasters you never learn what not to do. 3. I need to play more!!! I think I should have reached a stage now where I do not always need to use a photograph as reference and copy what is in front of me. I can use them but maybe add my own surroundings to it - well, that is the plan in my head at the moment. 4. More exhibitions! Many more as they can inspire as well as open your eyes to other approaches. I do get disheartened easily, but seeing art for real is so much better than viewing them online. Being aware of what I like and don't like and noticing instant reactions is part of the learning process. And discovering wonderful artists out there. So below is my last painting before the break. 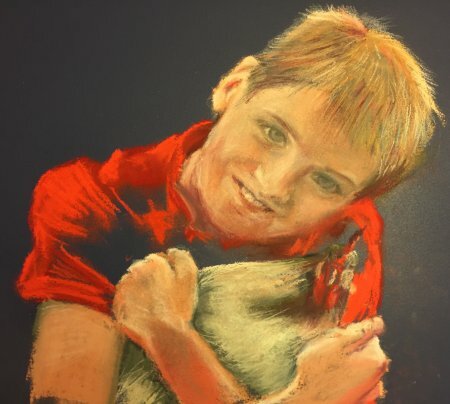 My son and our chicken Poppy who is surprised to have been changed to white, but the red feathers would have been lost in the piece. My son does recognise himself which is a good thing, family can be worse than any art critic. This is for him - to keep and when he is older it will be nicer to have than a photo I hope.